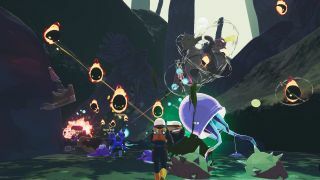 Risk of Rain 2 is meant to be played over and over again, and while it's rewarding to master your favorite character and try new items, it's also refreshing to play as someone totally new. Though you only start with the Commando, you can unlock several new characters in just a couple hours - or faster, if you know what to do. With that in mind, we've put together a guide on how to unlock all the current Risk of Rain 2 characters. New characters will be added in the future, so we'll update this guide as Risk of Rain 2 evolves in Steam Early Access. MUL-T is arguably the easiest character to unlock. All you need to do is clear the first stage five times. You'll naturally unlock MUL-T just by playing, and you also can speed up the process by farming the first stage. Just start a new single player game on easy difficulty, blast through the first zone, quit, and repeat. In theory, you can unlock the Huntress even faster than MUL-T, but it takes a little more skill. You'll need to clear stages one, two, and three in one run without dying. This is totally doable on single player, especially if you play on easy, but it will also work in multiplayer. Either way, just play it safe and press onward. Like MUL-T, you'll eventually unlock the Engineer passively while playing. To unlock him, you need to complete 30 stages. It doesn't matter what stages you clear, what characters you use, or what difficulty you play on. You could farm the first stage 30 times on or complete three impressive ten-stage runs. Just keep playing the game, basically. Obviously, playing on easy will speed up the process. Now we're getting into the stranger unlocks. To get the Artificer, you'll need to collect ten Lunar Coins and use them to free Artificer from the ice prison inside the blue item shop. Lunar Coins randomly drop from enemies, so just keep playing to earn more. If you're playing in multiplayer and someone in your group still needs the Artificer, be sure to ping Lunar Coins and share the wealth. Once you have ten coins, you'll need to visit the blue item shop. It can be accessed via a special portal which sometimes spawns after you defeat a boss. You can use this portal instead of the teleporter, and if you do, you'll get to visit a special item shop before starting the next stage. The Artificer is located inside this shop next to a newt-like merchant. Walk up to her ice prison and use your ten coins to free her. The blue item shop portal will spawn randomly at the end of stages, but you can also force it to appear by spending one Lunar Coin at the Altar of Newt located somewhere in the current stage. Note that you need to activate the altar before summoning the boss for that stage, otherwise it won't work. And if you do activate the altar, you'll need 11 Lunar Coins total to cover its cost and still have enough for the Artificer. Many players have reported a bug with the Artificer not appearing in the item shop while playing in multiplayer. If this happens to you and you've got ten Lunar Coins, just boot up a single player game and play until you get to the blue portal. The Artificer should be there. There are no shortcuts to the Mercenary. Playing on easy will soften the grind, but you'll still have to clear seven stages. Pick your favorite character, grab some friends, and start shooting.